The presentation of the film was extremely emotional, technically almost flawless and acting wise superb. The film was produced, directed and acted by Mr. Mahesh Sartape himself. At the end of his address he narrated a story of a small girl who was trying to save starfishes washed away at the seashore. He said even such small gesture elevates a Human being to the status of an Angle. On behalf of Suryadatta Students, Prof. Dr. Sanjay B. Chordiya, Founder President and Chairman, Suryadatta Group of Institutes, Pune thanked and promised Mr. Mahesh Sartape, Police Inspector that Suryadatta Students will be in forefront in following the traffic rules and helping the victims of the accidents. Mr. Manish Gupta, who is beacon light to his followers and acknowledged business and life coach; recently conducted life skill session at Suryadatta Group Institutes. Mr. R. D. Medge, President of Mumbai Dabbawala Association and his team members visited Suryadatta Group of Institute Bavdhan, Pune to conduct the Seminar on “Secrets of zero error in the Logistic Management by Mumbai Dabbawala”. 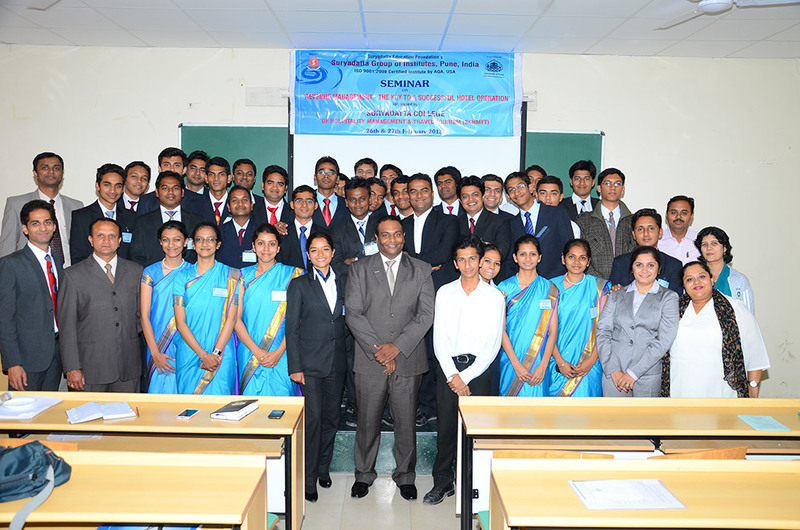 The seminar was attended by all students. The Suryadatta College of Hospitality Management, Travel and Tourism, Pune organized a Seminar on‘Revenue Management – the key to a successful hotel operations’ on 26th and 27th February 2013 at the Bavdhan Campus.More DetailsClick Here..
Mr Shivaji Desai, Joint Commissioner (Food) Food and Drug Administration (Maharashtra State) was invited to speak to the students about the food safety regulations and the procedure involved for procuring licenses for different food establishments. Mr Desai started the lecture by explaining that the Food Safety and Standard Act 2006 is an Act to consolidate the laws relating to food and to establish the Food Safety and Standards Authority of India for laying down science based standards for articles of food and to regulate their manufacture, storage, distribution, sale and import, to ensure availability of safe and wholesome food for human consumption and for matters. As per the ACT“Food” means any substance, whether processed, partially processed or unprocessed, which is intended for human consumption and includes primary food , genetically modified or engineered food or food containing such ingredients, infant food, packaged drinking water, alcoholic drink, chewing gum, and any substance, including water used into the food during its manufacture, preparation or treatment but does not include any animal feed, live animals unless they are prepared or processed for placing on the market for human consumption, plants, prior to harvesting, drugs and medicinal products, cosmetics, narcotic or psychotropic substances. “Food business” means any undertaking, whether for profit or not and whether public or private, carrying out any of the activities related to any stage of manufacture, processing, packaging, storage, transportation, distribution of food, import and includes food services, catering services, sale of food or food ingredients. He explained that to start any kind of food business a license has to be obtained. This can be done by applying online by going on the FSSAI website. As per the Act it is mandatory for the department to issue the license within two months of receiving the application. Mr Desai said that the information on the label of packaged products should be genuine and accurate. The date of expiry should be checked before consumption. The students found the lecture very informative and interesting and asked Mr Desai many questions related to the topic. The session helped the students to appreciate the importance of food safety and hygiene in the food business. They are now aware that the expiry dates of all products should be checked before using or consuming them and that there is a possibility of adulterants in food ingredients.